You are currently browsing the Athletic Tape Info Center blog archives for September, 2009. 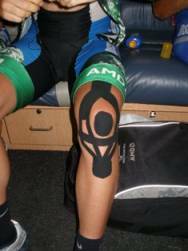 How Does Kinesiology Tape Relieve Swelling? One of the most amazing benefits of kinesiology taping is its ability to reduce swelling or edema. When properly applied, the results are often rapid, and are maintained as long as the tape is worn. What is it about this therapeutic tape that allows it to relieve swelling as no other modality can? First, a little background info. Similar to the circulatory system of blood vessels that carry blood, the lymphatic system consists of lymph vessels that carry lymphatic fluid. 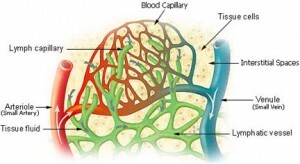 Rather than delivering substances to the tissues, however, the lymphatic vessels remove substances, including excess fluids, cellular debris and infectious organisms. Another difference is that the lymphatic system doesn’t have a pump, and relies on other mechanisms such as osmotic pressure and muscle action to move fluids through its vessels. The lymphatic system is the main mechanism for reducing swelling and edema in the body. When part of the body sustains a traumatic injury, cells in the area burst and spill their contents into the extracellular space surrounding the injured tissues. This fluid is a major component of the swelling that accompanies an acute injury. When a large amount of this fluid collects in an enclosed area, it exerts pressure on the blood vessels, lymphatic vessels and pain receptors. Severe swelling can actually reduce the circulation of both blood and lymphatic fluid to an injured area – the opposite of what it needs to recover and heal. When kinesiology tape is applied to an inflamed area, the lifting motion of the tape creates a space between the top layer of skin and the underlying tissues. This space creates a pressure gradient between this area and the surrounding tissues that allows fluids to move into the lymphatic vessels and be eliminated from the body. In addition, enhanced muscle activation increases the muscle pump pushing more fluid through the lymphatic vessels. The result? Swelling goes down, pain is relieved, and the healing process is accelerated! My next post will discuss how to apply kinesiology tape to facilitate lymphatic drainage. add comment | Comments Off on How Does Kinesiology Tape Relieve Swelling? One of the things that makes SpiderTech precut kinesiology tape both clinically effective AND cost effective is that a single application can be worn for up to 5 days. Clinically, this allows the therapeutic benefits to accrue, 24 hours a day, for the entire time it’s worn. No other treatment modality can come close to around-the-clock reduction of pain and inflammation for up to 5 days. Financially, given the $8 to $10 cost of a single application of SpiderTech therapeutic tape, this works out to less than $2 per day for one of the most effective therapeutic treatments available. Regardless of the price, everyone wants to get the most benefit from the dollars we spend. The best way to do this with SpiderTech Tape is to follow the application guidelines carefully to ensure the most effective, longest lasting applications. In the following video, Dr. Kevin Jardine, creator of the SpiderTech line of pre-cut kinesiology taping applications, outlines the 12 Principles of Application for successful taping. In the last few months the athletic therapy community has been invaded by a new breed of spiders. These spiders are leaving their distinctive marks on the necks, shoulders, elbows, wrists, backs, thighs, calves, ankles and feet of injured athletes. Rather than a cause for alarm, as one might first think, this spider invasion has been welcomed with open arms. Why? Because the spiders I’m talking about are therapeutic spiders, made of kinesiology tape … the thin, stretchy “miracle tape” that relieves pain, reduces inflammation and enhances function. Kinesiology tape hit the big time at the 2008 Beijing Olympics, where many of the world’s top athletes were seen wearing it on their injured or overused body parts. Instantly, people around the world started searching for this therapeutic phenomenon. Hundreds of thousands of rolls of the black, blue, pink or beige tape were sold. Unfortunately, many of these purchasers experienced a let-down after they found it, as they discovered that it was almost impossible to create, cut and apply the intricate configurations of tape without specialized training. This is where the spiders enter the story … or SpiderTech, to be completely accurate. SpiderTech Tape is the next generation in kinesiology tape – pre-cut, individually packaged kinesiology tape applications for specific parts of the body. No designing, no measuring and no cutting are required. Pulled groin muscle? Try the SpiderTech Groin Spider. Follow the simple instructions in the package and on the back of the tape, and you’ll have your own kinesiology tape application in a matter of minutes! Stiff neck? Try the Neck Spider. Plantar fasciitis? There’s a Calf & Arch Spider that works wonders. A Wrist Spider can be used for carpal tunnel syndrome, as well as strains and sprains. Other applications include Neck, Shoulder, Elbow, Upper Back/Postural, Lower Back, Hip, Hamstring, Ankle and three sizes of Lymphatic applications (designed to reduce severe swelling and inflammation). The products are backed with excellent instructional materials, both in the packaging and online. Free printable PDF’s are available providing step-by-step instructions for each of the 15 applications. For those who prefer to both see and hear instructions, there is also an instructional video for each product. Who’s using SpiderTech now? Coaches and trainers are carrying it in their kits. Athletes keep them in their sports bags, for quick application should an injury occur. Many physical therapists and chiropractors have incorporated kinesiology taping into their practices, and are loving the speed, simplicity and duplicability of working with pre-cut kinesiology tape applications. SpiderTech Tape can be used to treat acute or chronic injuries, as well as to prevent injuries from occurring in the first place. In addition to rapidly relieving pain and inflammation, it also enhances activation of muscles, providing a natural boost to performance. If you’re dealing with strains, sprains, any of the “itis” disorders, swelling and edema, stiffness, fatigue, cramps or spasms, it could be time to go on a Spider hunt! add comment | Comments Off on What is SpiderTech Tape? How Does Kinesiology Tape Relieve Pain? Today I’m going to focus on how kinesiology taping relieves pain. The physical qualities of kinesiology tape that are important in pain relief are its thinness and its elasticity, both of which are virtually identical to the same qualities in human skin. The puckering of the tape indicates that the upper layers of skin have been lifted slightly from the tissues below. This lifting action relieves pressure and irritation on the pain receptors directly under the skin, rapidly reducing the pain signals they send to the brain. Although the conscious sensation from a kinesiology taping application disappears very quickly, it actually produces an ongoing low level sensory stimulation for the entire time it is worn. Although virtually undetectable to the wearer, this sensory stimulation productes a continuous loop of stimulation from the muscle to the brain and back again. Because of its ongoing nature, this stimulation is able to interfere with and override many of the pain signals from the injured area. My next post will discuss proper application techniques when kinesiology taping for pain relief. add comment | Comments Off on How Does Kinesiology Tape Relieve Pain? 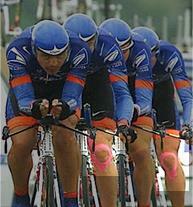 Since last summer’s Beijing Olympics, more and more professional athletes have been spotted wearing kinesiology tape. In today’s semifinal match at the US Open, Novak Djokovic, #4 player in the world, wore kinesiology tape on his left knee. Other prominent athletes who have worn kinesiology tape include cyclist Lance Armstrong and his entire US Postal team, soccer player David Beckham, and tennis players Serena Williams, Robby Ginepri and Justine Henin. The athlete responsible for much of the current kinesiology taping craze is beach volleyball player, Kerri Walsh, who displayed it prominently on her shoulder during the Beijing Olympic Games, at which she won Gold with partner, Misty May Traynor. 10. It’s lightweight and portable – easy to keep in a sports bag for last-minute applications. 9. It’s inexpensive (< $10 per application). 8. Once applied, it stays on for up to 5 days. 8. It’s so thin and stretchy that it’s virtually undetectable once it’s been applied. 7. It provides structural support without restricting range of motion. 6. It begins to relieve pain and reduce inflammation within minutes of being applied. 5. It enhances performances via increased activation in muscles that have “shut down” due to pain or injury. 4. It stays on through sweating, showering and even swimming. 3. It can be applied on any part of the body that is experiencing pain or inflammation. 2. 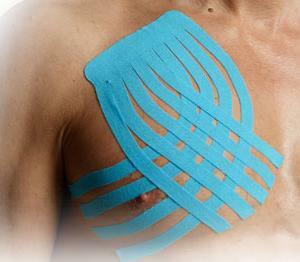 The new pre-cut kinesiology tape applications don’t require any specialized training to apply. 1. It comes in 4 colors and looks totally cool! For competitive athletes, kinesiology tape is becoming the “go to” therapy product for all of their aches, pains and injuries. Killer Spiders on the Beach! Spiders took over at several beach volleyball events this summer … SpiderTech Spiders, that is! SpiderTech is the name of a new type of pre-cut kinesiology tape that is currently taking the athletic world by storm. Already configured for specific parts of the body, a SpiderTech precut kinesiology tape application can go from sports bag to body in a matter of minutes. The result? Rapid relief of pain, swelling and inflammation, plus enhanced activation of injured or fatigued muscles. Decreased pain and increased funtion … sounds like a winning combination for any athlete! This image shows top AVP player, Nicole Branagh, wearing a SpiderTech Shoulder Spider as she wins the AVP Crocs Manhattan Beach Open with partner, Elaine Youngs in July. Kinesiology taping is an especially valuable tool for competitive athletes because it provides protection and support for injured muscles without restricting range of motion. This allows many injured athletes to continue to train and compete effectively as they recover from injuries. add comment | Comments Off on Killer Spiders on the Beach! The following video shows Dr. Kevin Jardine, inventor of SpiderTech pre-cut kinesiology taping applications, demonstrating the proper technique for applying the Low Back Spider to someone with lower back pain. This application technique is designed to reduce pain in the lower back and upper buttocks area. This technique also enhances muscle activation in painful back extensor muscles, allowing them to function with greater strength and endurance. This is especially important for athletes who need to continue training and/or competing, despite acute or chronic low back pain. 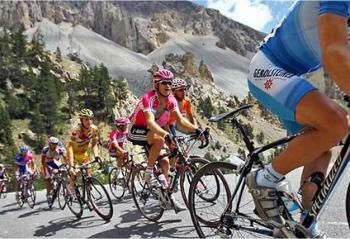 My last post discussed the incidence of lower back pain in competitive cyclists. The following instructions for applying pre-cut kinesiology tape for lower back pain are not limited to cyclists, however. Anyone who has experienced spasms, stiffness or pain in their lower back can benefit from the following technique. Unless you have specialized training in kinesiology taping techniques, I recommend using pre-cut applications. Already designed for specific parts of the body, precut kinesiology tape allows you to completely skip the often difficult steps of designing and cutting an application from a roll of kinesiology tape. There is only one brand of pre-cut kinesiology tape currently available. It’s called SpiderTech Tape, and it comes in 15 different applications for different parts of the body. As the following illustration shows, the reverse side of the tape is divided into numbered sections, making it simple to know which pieces to apply first. 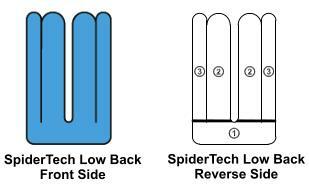 Here are the step-by-step instructions for applying the SpiderTech precut kinesiology tape application for the lower back. Ensure that the skin of the elbow and forearm is clean and dry. Prepare the precut lower back kinesiology tape by tearing the backing along each of the perforated lines. This will allow you to apply each section individually, creating a more effective application. Step 1: With subject standing, peel the backing from half of section 1 and apply (with no stretch in the tape) at the base of the lower back. Remove the remaining backing from section 1 and apply. Gently rub the tape from the center toward the outside to activate the glue. Step 2: Have subject bend forward into a curled position to obtain maximum stretch of the back extensor muscles. If necessary, the arms can be used to support the upper body against the thighs. Step 3: Begin peeling the backing from the left “arm” of section 2, and begin applying the tape (with no additional stretch) along the muscles directly left of the spine. Continue removing the backing and pressing the tape against the skin until the entire strip has been applied. Step 4: Begin peeling the backing from the right “arm” of section 2, and begin applying the tape (with no additional stretch) along the muscles directly right of the spine. Continue removing the backing and pressing the tape against the skin until the entire strip has been applied. Step 5: Begin peeling the backing from the outer right arm of section 3, and apply the tape (with no additional stretch) in the direction of the right armpit. Continue peeling away the backing and applying the tape until the entire section has been applied. Step 6: Begin peeling the backing from the outer left arm of section 3, and apply the tape (with no additional stretch) in the direction of the left armpit. Continue peeling away the backing and applying the tape until the entire section has been applied.